Garden Center vs Big Box Store Landscaping. 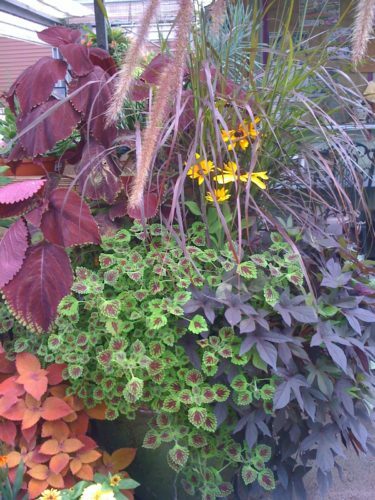 A few weeks ago, when the weather started to finally warm up, one of my garden design clients met me at a big box store and then a local garden center to see the differences in plant quality and availability. I took her through the offerings at big box store Lowes and then at our local Merrifield Garden Center. Each offers different pros and cons for landscaping your property. 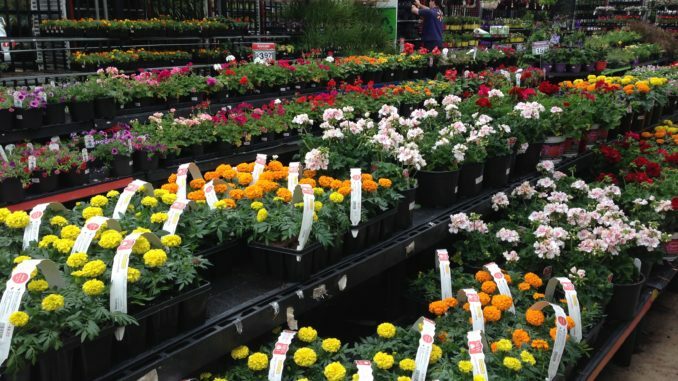 The big box stores such as Walmart, Home Depot, Lowes, and the like, can offer a much lower price for basic plantings. Herbs, annuals, perennials, trees, and bushes are usually inexpensive and will likely survive just for the season if not properly cared for at the stores. However, some plantings are not necessarily indigenous to your specific area, nor will they necessarily thrive in your local climate. When I lived in Pittsburgh, PA, I remember seeing the large outdoor tropical cannas for sale at the local Home Depot. Usually cannas are hardy to Zone 7. Most of Pittsburgh is located in the cooler Zone 6 which is pretty iffy for cannas’ winter survival. That did not stop unknowing gardeners from purchasing and planting the cannas and then being surprised when they didn’t survive the cold snowy Pennsylvania winters. 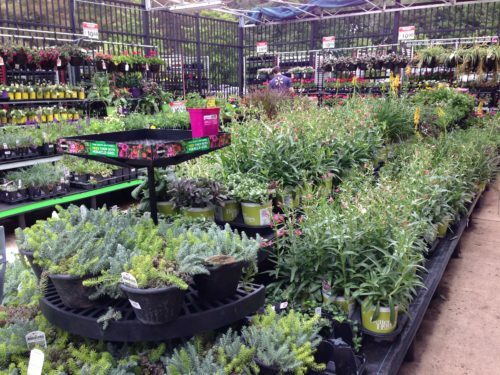 A local garden center will generally have plants that “work” better in your area. 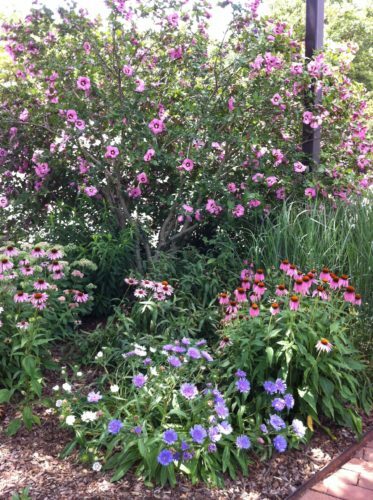 These plantings will be better suited to your climate. These garden center plants are likely more expensive than those at the big box stores. However, if something is wrong with a plant, the garden center personnel will likely know more about what pests are more prevalent in your area and which pests could be affecting your plant. Also, the local garden center will likely have a far better variety of different plants than the big box store. 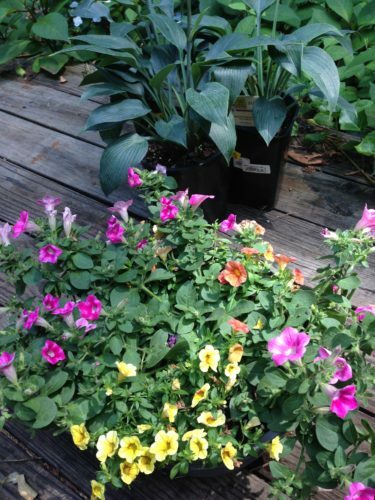 Where the big box store may carry three colors of petunias, the local garden center will likely carry 10 colors or more. The local garden center’s plants usually receive far better care. I saw a table full of dried out and sad-looking tomato plants at my local Walmart the other day. Also, I saw the annual impatiens that are not thriving in many areas due to an impatiens blight. 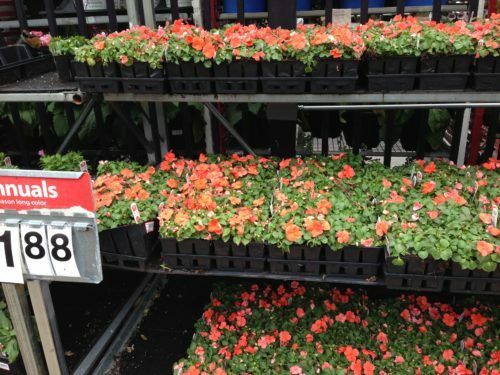 Most of the local garden centers in my area are refusing to sell these blight-susceptible annual impatiens. While she was fairly familiar with Lowe’s and other big box store offerings, my client was in awe as we walked around Merrifield Garden Center. “MGC”, as I call it, has a pretty good variety of locally grown plants as well as native Virginia plants. It’s funny that they are selling mayapple plants and Virginia creeper vines when I tend to have an abundance of those plants and end up pulling out the extras. 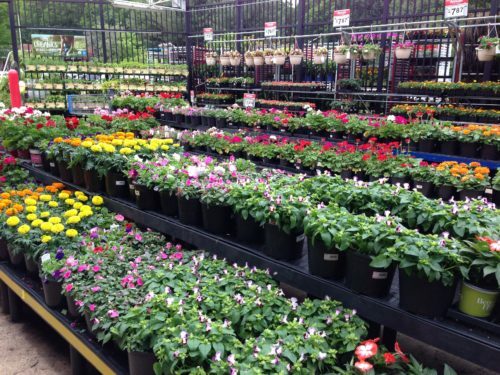 MGC is a family-owned business that has grown from a small plant stand to several very large garden centers. Their locally sourced plants tend to do better in this area since the plants are already used to the local conditions. They say that variety is the spice of life although my client tends to want to plant the exact same plants every year. She loves the big puffy taller yellow marigolds and the smaller more compact golden marigolds. She loves colorful pink and purple petunias and wasn’t really aware of all of the colors that are available since she was only shopping at the big box stores. It is the same with roses. She has some really old vintage roses planted by her mother in the 1950s that have done pretty well even though she lives in Deer Country. She was very excited to see the disease-resistant Knockout roses. I suggested that she purchase several yellow ones to plant against a dark red brick wall in her back garden. She said she would not have even thought about yellow roses as she’s always grown red or pink roses in her garden. My client selected quite a few plants that are new to her but have been on the market for years. She was overwhelmed by the selection of well over 50 different varieties of hostas and picked a few types for her shady garden. We wandered through MGC’s massive display gardens to get more ideas for her landscape. It’s rare to find display gardens at a big box store! 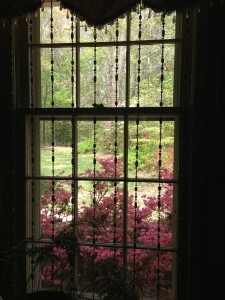 I tend to like to “break up” the monotony of the landscape when I’m working on my own garden or designing for clients. My favorite spiraea shrub was purchased at MGC. It’s called “Gold Flame” spiraea and has hot pink magenta flowers with bright chartreuse leaves. 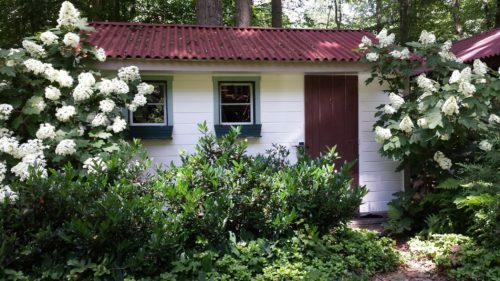 Having a shady landscape for most of our property, we tend to have the older azaleas that aren’t browsed much by deer and many other deer-resistant plants such as spiraea. 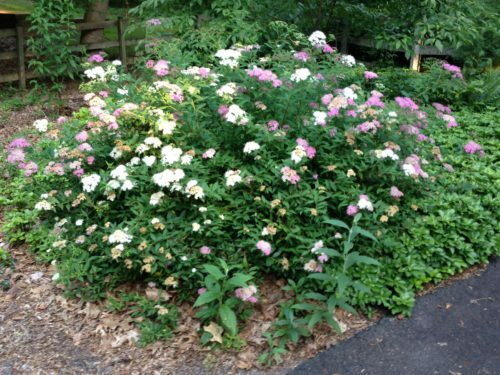 My client had not seen this spiraea and was delighted to find that it would nicely compliment her own more traditional white/pink Spiraea japonica “Shirobana” shrubs. I have a few Shirobana spiraea shrubs with showy white, pink, and magenta blooms that shine all summer and never ever disappoint. Even the Japanese beetles leave the spiraea alone! The other day, while scoping out new plants for a different garden design client, I happened to run into one of the plant vendors at my local Lowes big box store. The vendor lady and I were discussing deer resistant plantings. She was bringing in a number of new plants for sale in the perennials section. As we were talking, she mentioned that Lowes would be marking down a bunch of the highly regarded Monrovia plants for clearance. 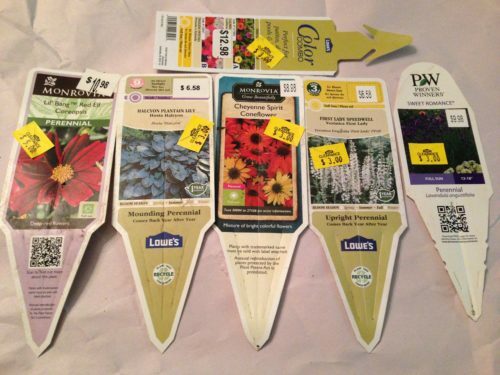 So…plants that were originally priced at $12.98 or less were marked down to either $3 or $5. I was able to get 13 plants for my own garden for about $38 that would have cost me over $120 at full price. And since I have a Lowes credit card, I got an additional 5% off. Pretty nice score if you ask me! And it just happened to be that the young girl discounting the plants was happy to mark down the contents of my cart before finishing the rest of the markdowns. And I estimate that purchasing the same plants at the garden center would have run at least 50% more than the Lowes retail price — so about $180. Now to qualify this — I bought perennials that hopefully will come back each year. Normally I recommend buying just your inexpensive annuals at the big box store. Yet these perennials were in great shape and I’m guessing they weren’t out on the selling floor for very long. Additionally, as part of my purchase, I’m excited that I was able to replace three of the blue Halcyon hostas of the thirty assorted hostas that were eaten by the voles over the winter. We’ve found that the only reliable way to eradicate the voles is by using a smoke bomb in their tunnels. As a future deterrent, I’ve also poured castor oil onto the ground around my remaining hostas and applied some vole deterrent granules. While I understand that a vole is a living creature, so are my hostas. 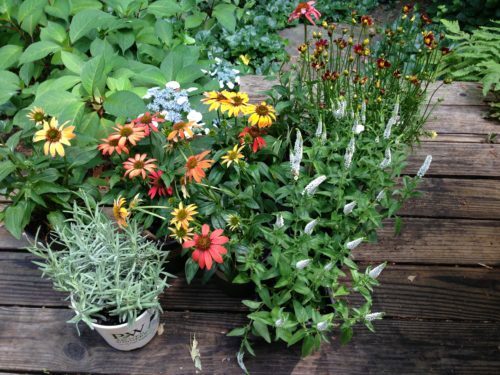 So…should you landscape via the big box store or your local garden center? I’m going to say to use both. Why? 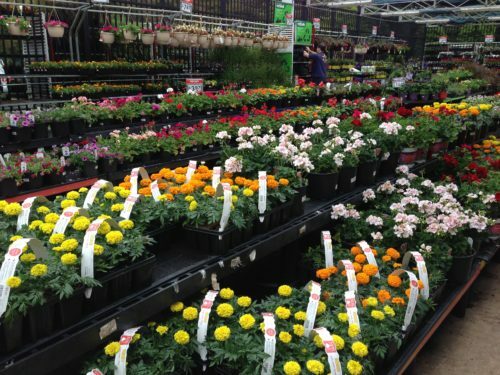 First, you can head to your big box store and see what’s available there, pick up some annuals that only last one growing season, and maybe even score a healthy discounted plant or more. Most of the big box store selection will likely turn over quickly and/or won’t remain healthy and vigorous for long. 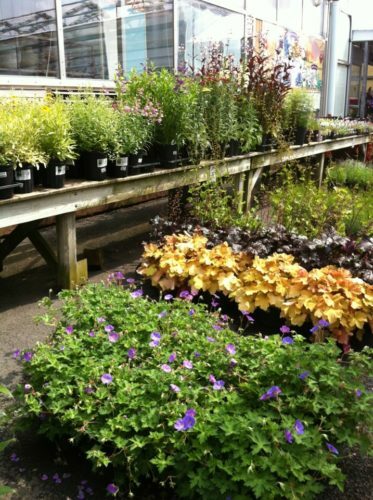 Your local garden center will take far better care of their vast selection of plants. 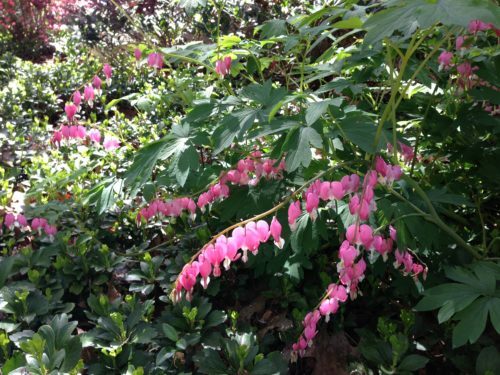 You’ll find native, bog, rare, and specialty plants in display gardens and available for sale at your local garden center that you won’t find at the big box stores. And again, your local garden center will have knowledgeable personnel to help you with plant problems and other landscape issues. 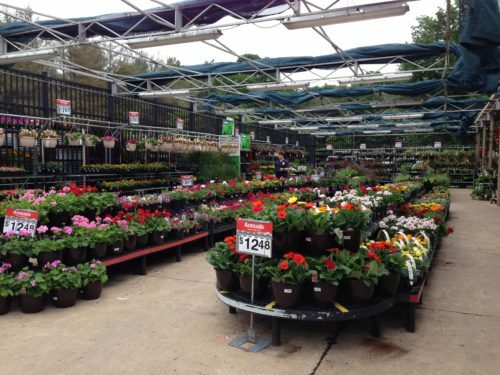 What’s YOUR opinion on big box store vs local garden center for landscaping? Leave a comment and let all of us know!